"Our kids request this meal every time we go camping, and seeing as we have about 15 laying chickens, it's a great way to use up eggs! Please note, this makes a LOT! 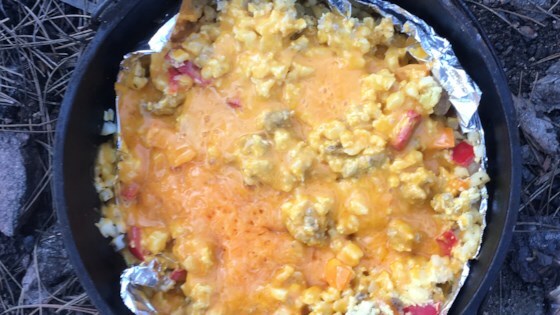 You may want to consider sharing it with your camping friends or, if you're like our family and enjoy leftovers, just save the leftovers for the day you're leaving the campground and need a quick breakfast without a lot of mess and fuss. You can easily re-heat it in a microwave or in a skillet over low heat. Feel free to add more spices and personalize this recipe to suite your taste buds!" Build a campfire and allow the fire to burn until it has accumulated a bed of coals. Cook and stir the sausage, onion, and garlic in a 12-inch cast iron Dutch oven with lid, raised over the coals to medium-high heat, until the sausage is no longer pink and the onion is tender. Stir in the red bell pepper, green bell pepper, and hash brown potatoes until evenly mixed. Cook, stirring occasionally, until the hash browns are hot and the peppers are tender, about 15 minutes. Pour the beaten eggs evenly over the top of the potatoes, allowing them to sink into the potatoes. Cover the Dutch oven, and place 6 to 9 coals underneath, and 12 to 18 on top. Allow to bake until the eggs are firm, about 40 minutes. Sprinkle with Cheddar cheese, cover, and continue cooking until the cheese has melted, about 5 minutes. This eggy Easter treat boasts bacon, cheese, hash browns, and veggies. This recipe tasted great! I cooked it at home, in a frying pan on med heat, and put it in the oven at 350 for the same amount of time. My family really enjoyed it. I made this in a 9+13 pan and it was great! Made a ton of leftovers which is what I wanted. Great recipe!